Chicken is truly the great American protein. It is inexpensive, and there are a million and one things you can make with it. The problem with chicken is that, all by itself, chicken really doesn't have a lot of flavor. Also, it can go from succulent to dry in a Nano second. However, I have some really simple and inexpensive steps to get that perfectly moist, and flavorful piece off of the grill every time! As I said before, chicken on its own is not very flavorful. One of the best ways to give it some great flavor, is to put it in a marinade. Now I know that there are hundreds of great packets and bottles in the stores, but those can be loaded with salt and preservatives. Not mention they cost money. And hey, I bet you have the stuff in your pantry right now to make a great marinade of your own. The one I am going to show you is literally something I whipped up with no recipe. I wanted you to see how easy and accessible it really is. One of the bases of any great marinade is an acid. Here I am using a lemon. If you don't have fresh lemon, you can use the bottled stuff. But since I DO have a lemon on hand, I am going to get all of the flavor I can out of it. So, using a microplane, or the fine grate side of your box grater, zest your lemon and add it to the bowl. Next S-Q-U-E-E-Z-E all the juice you can out of that guy! It will give you roughly a 1/4 cup. Add the Dijon mustard and brown sugar as well. so I threw a little of that in there. One thing I would have done different here is chop it up finely. If you don't have rosemary, thyme, oregano, parsley, even basil would be great here! Now for the other base of this marinade, the olive oil. The rule for marinades is 2 parts fat to one part acid. So, you will pour in about a half a cup. Now whisk it all together until smooth. It will be the color of a Dijon mustard. is to score the meat. This way the marinade can permeate deeply into the flesh. Season it up with a little salt and pepper. Then, place in a Ziploc Bag and pour the marinade over it. but you can leave it like this for up to 24 hours if you like. You will want to turn your burners on high to heat things up. Once hot, clean the grates with your wire brush, and oil with a towel. Now you should turn your burners to medium. This will help the chicken cook more evenly. Now remove the chicken from the Ziploc bag with tongs, and place at an angle on the grill. Close the lid, and let cook for 3 minutes. Then turn the chicken to the opposite angle. and cook for 3 more minutes. 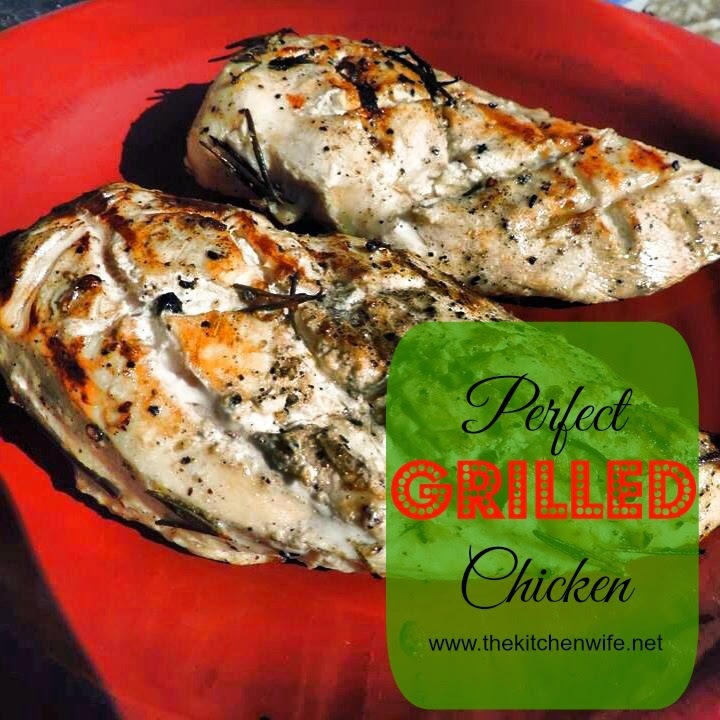 This will give the chicken those great grill marks you love! After 6 minutes on one side, flip and repeat the process. and let rest for 5-10 minutes. And can I just say YUM! I guarantee this is going to be the juiciest, most flavorful piece of chicken you have ever had! Serve it with a salad, on pasta, in fajitas, with potatoes and green beans, however you choose! It will not disappoint! Now fire up those grills and give this a try! I know you are going to love it! I would love to hear from you in comments, on TKW Facebook page, or on Pinterest! Then slice the lemon in half and squeeze juice into bowl. Add the rosemary, Dijon mustard, and brown sugar to the bowl. While whisking, add the oil to the bowl. With a pairing knife, score the top of the chicken breast in a crisscross pattern. Place the breasts in a Ziploc bag. Work the marinade, in the bag, so it is coating all of the chicken. Press all of the air out of the bag, close it, and place in the fridge for 30 minutes to overnight. Turn the burners to high, and heat the grill. When hot, clean the grates with your brush, and oil with a towel. Drop the burners to medium. Remove the chicken from the Ziploc bag, and place, at an angle, on the grates. Then turn (NOT FLIP) the chicken to the opposite angle. Flip the chicken and repeat process. Remove from grill and allow to rest for 5-10 minutes.